Email us a review of your last flight, and we will send you flight discount vouchers. It may not be the quickest way of getting there, but Emirates often offers the cheapest flights from Johannesburg to London. The reason Emirates flights are not the quickest is that you have to stop and change planes in Dubai - however, this can also be looked upon as an opportunity to leave the airport and see a bit of Dubai (if you're thinking of doing this try time your trip to London for Spring or Autumn, as summers in Dubai are terribly hot & humid - think Durban summers times 3). If you leave Johannesburg at 13h50 you arrive in Dubai at 00h05, which works if you're not interested in seeing Dubai and want to arrive in London in the early morning. If you leave Johannesburg at 19h15 then you arrive in Dubai at 05h15, which is perhaps a little bit early to be arriving in Dubai if you want to spend the day there before you head on to London. If you leave Johannesburg at 22h20 then you arrive in Dubai at 08h20, which is a perfect time to arrive in Dubai with the purpose of spending a day there before heading on to London. All Emirates flights from Johannesburg are from OR Tambo International Airport (JNB) to Dubai International Airport (DXB). Emirates flights to London are mostly to Heathrow Airport (LHR), but there are some to Gatwick Airport (LGW). Emirates uses Boeing 777-300ER jets on its Johannesburg to Dubai leg as well as on its Dubai to London Gatwick flights. 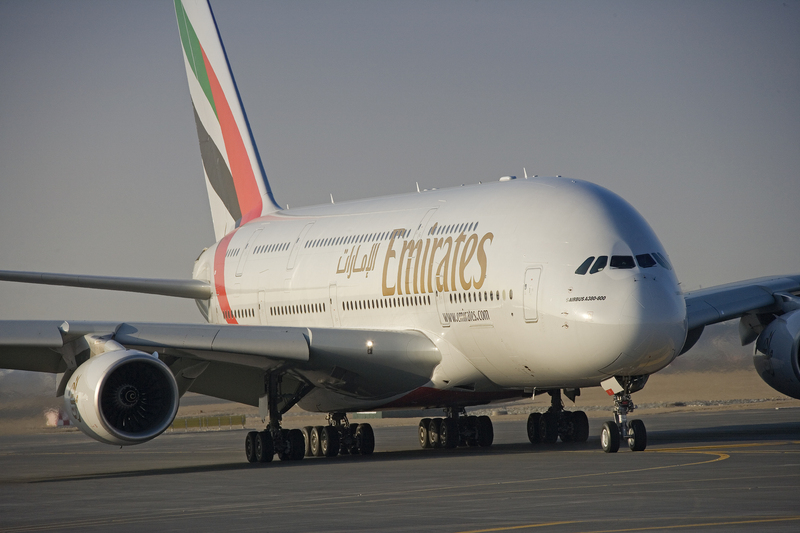 Dubai to London Heathrow flights are operated on Airbus A380-800 planes. Flights from Johannesburg to Dubai are scheduled to take some 8 hours & 15 minutes (to cover 6389km), and from Dubai to London Heathrow some 7 hours and 55 minutes (to cover 5505km). Dubai to London Gatwick is 10 minutes quicker, taking 7 hours and 45 minutes to cover 5480km. I wouldn't say I'm the world's worst traveller but I am certainly not up there with the best. The method I use to appraise my ability to travel well, is to evaluate my physical appearance before I embark on any journey and again when I arrive at my destination. In all fairness, I don't look fantastic when I begin my journey but it always amazes me as to how much worse I can look upon arriving. So close to the end, I never thought I would finally be betrayed by a malfunctioning flushing mechanism. Surely not on one of the best airlines in the world? After being trapped in the eye of an unsanitary tornado with about 70 billion airborne germs whirling around me, I can safely say that my physical appearance and demeanour for the rest of that flight was less than attractive and congenial. I bemoaned my circumstances and flashed poisonous glances to all the staff and other passengers who seemed to be coping better than me. Needless to say, I travelled even less well after that experience and no amount of goodwill and great service could turn it around. So the following year when I was booking my flight from Jhb to Heathrow, I thought to myself: "I'll just book the first fairly-priced flight I can get, no matter the airline. Let's just get these 9 hours over and done with". I didn't expect much while boarding my flight so imagine my surprise when from the moment I checked in to the moment I landed on the other side, I found myself thoroughly enjoying every minute of it. From the good service to the sheer amount of space! I felt I was travelling first class and was treated that way by every cabin attendant. The food was spectacular and I don't use that adjective loosely, particularly when referring to airline food. And there was plenty of it. They just didn't stop feeding us, which in my opinion, is one of the best ways to kill time on a long flight. Another fantastic thing was that everything onboard actually worked. From the flushing mechanism in the bathrooms (my first concern when flying these days) to the remote for my tv, no small feat I would say. The blankets were warm and not too small, the pillows were comfy and the space in the aisles was more than sufficient. As a passenger, travelling in economy on an international flight, I didn't once feel hard done by or treated like a piece of luggage. In fact, I hardly envied the first class passengers at all. Except for pondering what nirvana lay beyond those curtains if this was how things were back here in coach. When I landed on the other side, I felt great. Relaxed and in a surprisingly pleasant mood. If I felt good I must look good, I thought. So, I rushed to the first bathroom in the airport to have a look at myself in the mirror. The real test of how well I travelled this time. I was surprised to see a glowing, pinkish hued (as opposed to ashen, which was what I was used to after long flights), bright eyed, smiling woman staring back at me. I jumped up and down in front of that bathroom mirror and I no longer envied the good traveller, I was one. And I have Emirates Airlines to thank for it. A truly first class experience in every way. Other Middle-Eastern airlines are Etihad, Qatar Airways, Turkish Airlines, El Al and Egyptair.